Adding a GUI to your scripting work with KiXforms, part 2. It's been a while since we talked about creating a GUI for working with scripts (and my editor says to blame him for the long respite). Particularly, we talked about using KIXforms to do it and I showed you a nifty sample to get you started down that road last time. Let’s get into it by walking through the creation of a simple dialog (see Fig. 1) The script contains a main form, an image (known as a PictureBox), some text (known as a label) and a button. The button is instructed to end the script. It's not much, but it's a very good start to seeing just how KiXforms operates and how you can take advantage of it in VBScript. the standard console window full of text.
" 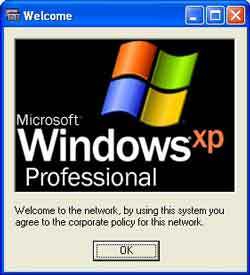 corporate policy for this network." Finally, specify the size, location and text for the button. Here, you'll also set your first event. When the button is clicked, you'll want to run a function called ExitScript. This is set as a string which is executed when the event is triggered (in this case the OnClick event that happens when someone clicks the button). This provides most of the structure you need to get started, and you can get plenty of help from the help file provided along with the KiXforms binary at http://www.kixforms.org. In the next (and last) article in this short series on KiXforms, I’ll cover some of the more advanced controls that you can’t get using a traditional HTA graphical interface -- this is where the freely available KiXforms really shines as a unique and powerful tool for your scripts. Bob Kelly is president and co-founder of AdminScriptEditor.com, home to an integrated suite of scripting tools and a shared library of scripts and language help. He has authored books on scripting and desktop administration and several white papers. Bob also owns and operates AppDeploy.com, where he writes and produces videos on topics related to software deployment.